Archaeological documents or artefacts are usually found in a poor and fragmented state, owing to its long age. They are many times too complex to deal with manually. Since the 1960s researchers have been exploring ways to overcome these challenges. There are findings which suggest that in 1964, computational solver was introduced that could solve a nine-piece puzzle. While these were rudimentary efforts, researchers are now using state-of-the-art techniques based on natural images, colour matching, shape matching, and others to design algorithms and solve twisted puzzles in archaeology. In a recent development, researchers at Technion and University of Haifa, Israel have proposed a new algorithm that is able to fix these issues with computer vision. The point creates the gaps between the pieces resulting in harder to match adjacent fragments. The second point causes spurious edges which make it complex to solve the problem and lastly, continuity refers to the valid transformation of the pieces that belong to a continuous space. In order to overcome these difficulties, the researchers evaluated four key ideas. In order to address fragment abrasion, the researchers proposed to extrapolate each fragment prior to reassemble that reduces the continuity problem. Secondly, a transformation sampling method is suggested based on the configuration space tailored to the problem. In the third case in order to make a good match, a new measure is proposed that takes into account special characteristics of the domain like the gaps between the pieces, colour fading, etc. Finally, the placement of the pieces considers all of the above three cases as well as the confidence in the match where the confidence referred to the uniqueness of the match and the fragment size. With the goal of reassembling an artefact, the images of the artefacts are captured and provided in a single fragment into the algorithm. A total of four steps concludes the proposed algorithm. Here, each fragment is hypothesized in order to convert it into a matching problem rather than a continuation problem such that a wide band is produced around the fragment that not only predicts the eroded region but also make a continuation to the next fragment. The motive of this step is to make sure that the transformed fragments are nearer to each other and do not overlap whereas the extrapolated fragments from step 1 are needed to be overlapped. Later, it will be fine-tuned in order to make the most promising transformations. This step computes the scores of dissimilarities for the transformations between the given pair of fragments. Evaluation of confidence is that a small dissimilarity between two fragments indicates adjacency. A confidence score is then computed where the likelihood of the pair of fragments are predicted to be neighbours. This is the last step of the algorithm that evaluates the reassembling of the artefacts from its fragments. The placement strategy follows a greedy approach where one fragment is added iteratively at a time. 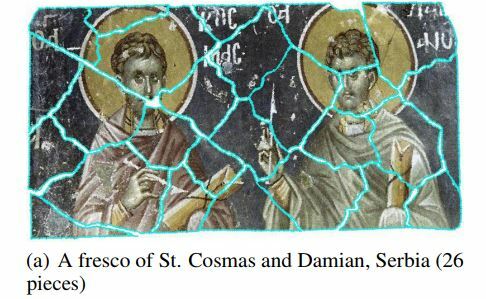 The proposed algorithm is tested on the real archaeological artefacts from British Museum and frescoes from Churches and it provided accurate results both qualitatively and quantitatively. 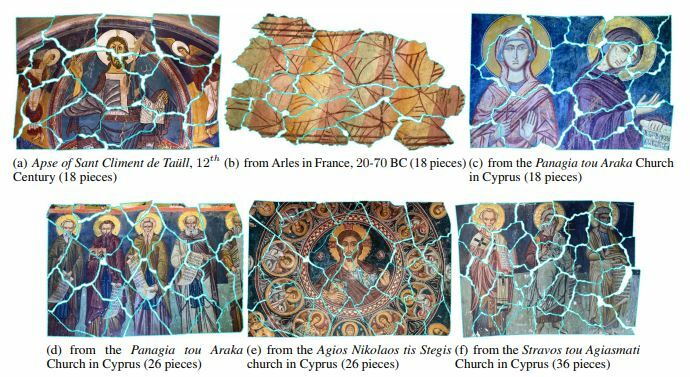 The algorithm works perfectly well on almost all the archaeological artefacts and the frescos. 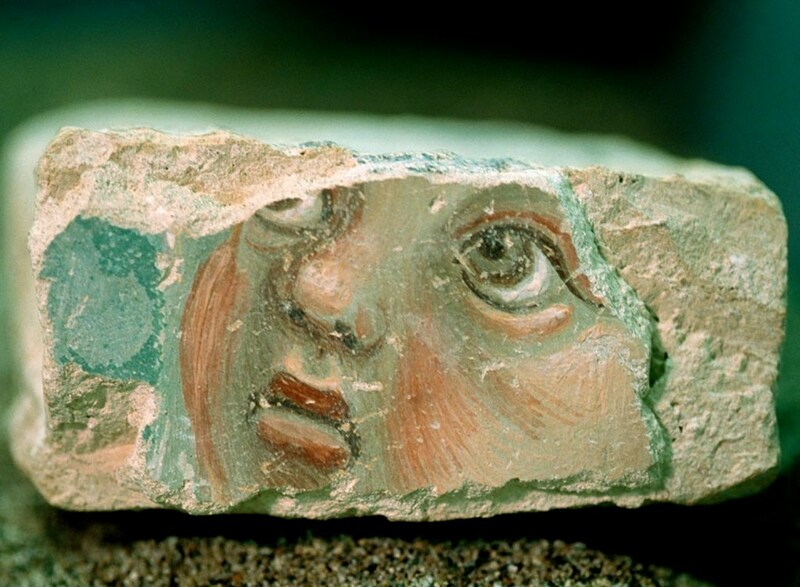 But one limitation was found when researchers tried to match a broken fresco with a large gap in the middle. The algorithm failed to reassemble the fresco because the neighbours on both sides of the gap did not match and instead matched the part where the patterns are continued.